Once your dental implants have been inserted and have fully healed with your jawbone, Dr Poulos will begin the process of making your permanent, fully restored implant teeth or restorative implants. These include crowns, bridges and implant supported dentures. Will My Restorative Implants Look and Feel Natural? Every restorative implant has to be carefully designed to provide a natural appearance while restoring your ability to eat and chew properly. 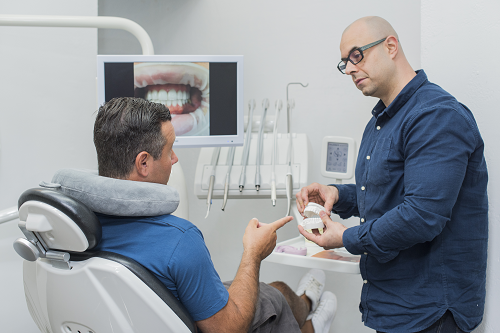 Dr Poulos will ensure your restorative implants provide the correct support for the muscles in your cheeks and lips, which is particularly important if you require multiple restorative implants or implant supported dentures. This is because the proper height between your upper and lower jaw must be maintained or restored. How Will My New Teeth Be Fitted? Restorative implants can be cemented, screwed or clipped into place, depending on the restoration. Single restorative implants and implant bridges are generally cemented or screwed into place. There is no need to worry that the screws will be visible as these are covered up with tooth coloured composite resin. The idea behind screwing a restoration into place is to allow for easy retrieval for maintenance. If you require an implant supported denture, this may clip onto the dental implants so even though it is fully secured, you will still be able to easily remove it for cleaning.